Save the Children UK has criticised The Sun newspaper over a story focusing on the money the charity has paid to an advertising agency that was co-founded by the brother of Justin Forsyth, the charity’s chief executive. 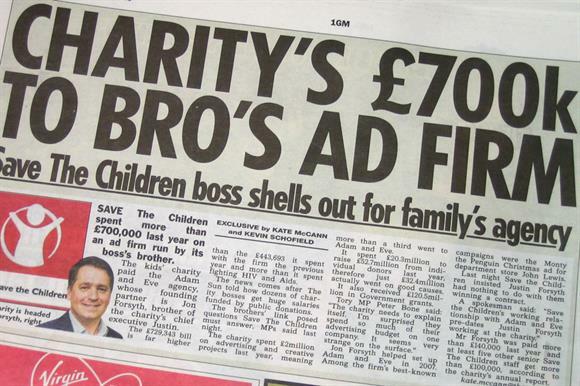 Today’s Sun features the story on page 4 under the headline "Charity’s £700k to bro’s ad firm – Save the Children boss shells out for family’s agency". But a spokesman for the charity said the newspaper "has misrepresented the transparent nature of the relationship" between the charity and the agency, called Adam & Eve, of which Forsyth’s brother Jon was a founding partner and for which he continues to work. The charity disclosed the £729,343 it spent with the agency in 2014 as a related party transaction in its latest annual report, published on its website last week. The Save spokesman said: "Save the Children’s relationship with Adam & Eve pre-dates Justin Forsyth working at the charity and it has been consistently and openly declared. It started after a thorough competitive tender process overseen by an external third party, and Mr Forsyth has no input in awarding any contracts to Adam & Eve." Justin Forsyth joined the charity in July 2010, three months after it appointed Adam & Eve in a contest in which six other agencies competed, according to the advertising industry publication Campaign. The Sun story claims that Adam & Eve is run by Jon Forsyth. He was one of four founding partners, but he has not been its chief executive and is its communications strategy officer. Adam & Eve was acquired in 2012 by the larger advertising group Omnicom. Adverts that Adam & Eve has created for Save the Children include one that attracted 614 complaints to the Advertising Standards Authority, most of which said that its images of live childbirth were offensive, overly graphic and distressing. The ASA rejected the complaints about the advert, in which a baby initially appears to be stillborn and was designed to illustrate that a million babies die on the day that they are born each year.